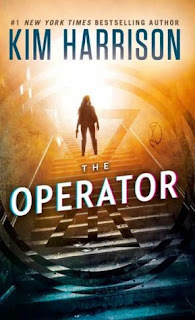 The Operator is book two in The Peri Reed Chronicles. I knew I'd have to get this book since I enjoyed book one and really anything written by Kim Harrison is a must read for me. I will warn you though that this series is quite different from The Hollows series. Please don't start these thinking they're going to be similar. In case you don't remember or haven't started this series yet here is a little refresher. The series is focused on Peri Reed, a drafter that is able to rewrite time but unfortunately when that ability is used she loses some of her memories. Drafters are paired up with another person that is able to build their memories back afterwards. While that sounds like the perfect balance, it can be used in naughty ways since they can implant false memories instead. In this installment Peri is in hiding from the corrupt agency she was trying to take down from the inside. Her life quickly goes from mostly normal to straight back into action though. She finds out there is a new drug that will enable drafters to retain their memories without another person aiding in that step and of course her old handler wants her to be the guinea pig. He glosses over the fact that she'll become addicted to it and need him to be her supplier for the rest of her life if she takes it though. Peri's smart and during all the action in this one winds up teaming with new friends as well as old in attempts to find out more about the drug and take down her old team. The Operator is an adventure you won't want to miss! I love that this series has short period time travel abilities and that they can't really be all powerful since they lose memories as a balance. It's refreshing in a genre that seems to come with all powerful characters quite a bit. Peri is just trying to live her life but keeps getting dragged into messes that she has to clean up. While not a ton of progression happened in this installment, I feel like the next book is going to be quite interesting. We get to know more about Peri and what makes her tick as well as some of her old memories and friends. All in all, this was a solid sequel and if you're fond of Urban Fantasy with little to no romance I think you'd enjoy this series! I haven't started this series or her Hollows series yet (saving for next year) but the hype over this one has me wanting to drop what I'm reading and get the first book and dive in. This one sounds really good I'm glad you loved it and it kept up the momentum! I love both series, though I do tend to like paranormal a bit more so The Hollows series will always have a special place in my heart. Hope you enjoy when you read them next year! :P Which book/series do you think you'll start with? Little to no romance, yes please! I think I heard of this one!? Looks different from the author's previous series with witches. Yeah, way different from that series! Still need to read these! At least you have two books to read now instead of just the first lol! I like when I have multiples and can binge read/listen. I would like to pick up this author, but I think I would have to be in the "right" kind of mood for it. Sounds like a solid read. Glad you enjoyed it. She can "rewrite" history? Okay, I'm in. I'm listening to The Drafter (again) to remind me what was going on before starting this one. So glad you enjoyed it. Makes me even more excited to try it.